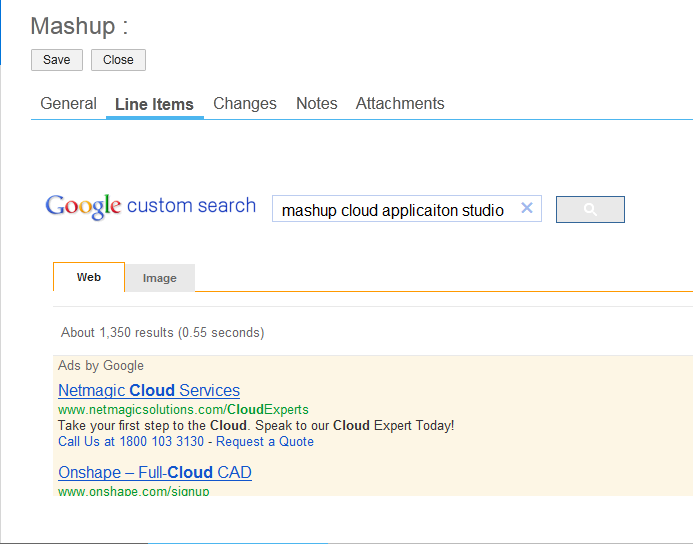 Mashups is an easiest way to integrate external systems in Cloud Solutions. Mashups are used to integrate data from SAP’s cloud solution with data provided by an online Web service or application. Users can access the content provided by these Web services and applications. For Example, Mashups can include Web searches, company or industry business information, or online map searches. Before starting the mashup, you should have some basic knowledge in web development. I will take a simple example but will try to use a complex scenario so that you all will know in and out of mashup and how it works. Using the studio, we can create mashups for an SAP cloud solution. Add a Mashup to an SAP Floorplan. Add a Mashup to Your Floorplan that you have designed. 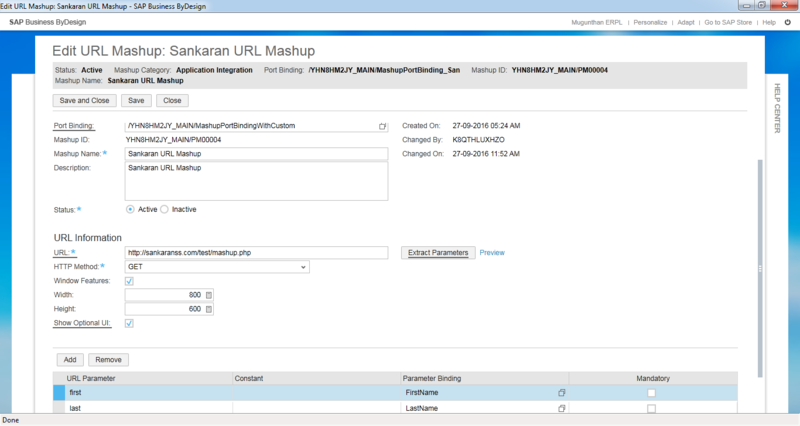 A mashup that sends data from SAP’s cloud solution to the URL of an online service provider. The service provider uses the data, for example, to perform a search, and the results are displayed in a new browser window. A mashup combines and displays data from both internal and external sources. To create a data mashup, an integrated authoring tool is used to transform or merge external Web services with internal business data using industry-standard Web service protocols. 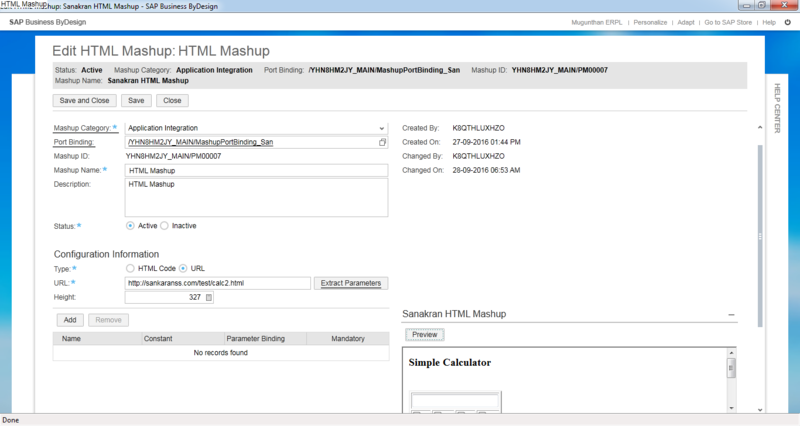 A mashup that has been created as an add-on solution by SAP. You can create new data, URL, and HTML mashups. 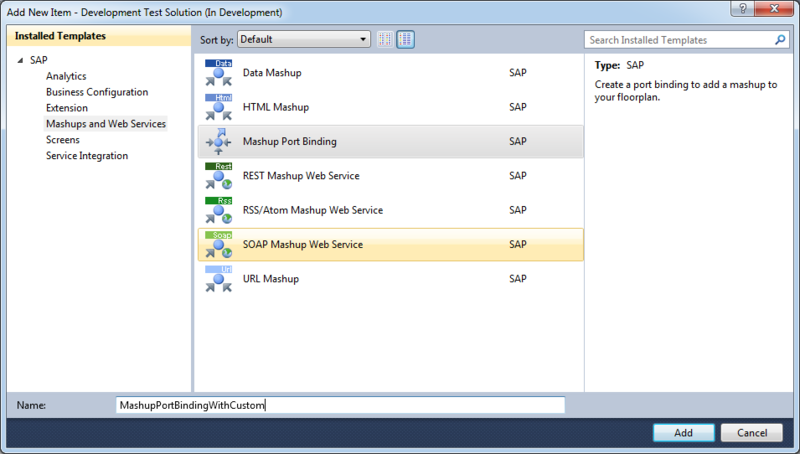 Custom mashups can be created only by SAP. We will discuss process flow steps one by one with an example. You must enable the admin mode for the solution in which you create the mashup to ensure that the system saves your content and any changes you make in the solution. 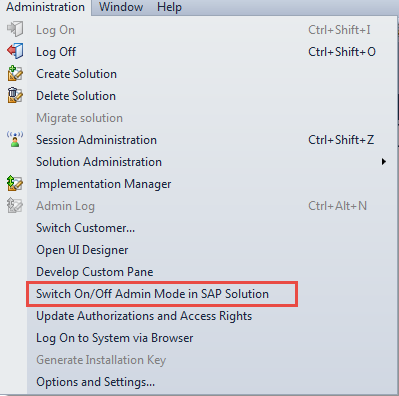 To enable, open your solution in SDK and select Administration -> Switch On/Off Admin Mode in SAP Solution. Create a custom Business Object Mashup. Define two elements as shown in the below screenshot. If the mashup is going to return data that is entered automatically into the cloud solution, then you need to create a port type package for the mashup. Create screens for the Custom BO. 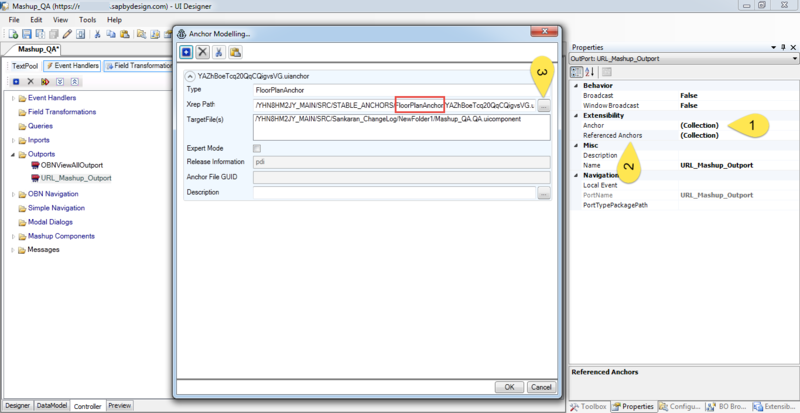 In the Solution Explorer, right-click the project folder and select Add New Item. In the Name field, enter a name for the port type package. Select Port Type Package. The Select Business Object dialog box opens. You choose your Bo name (for example, mashup) and click Ok. The port type package is added to your project. Your solution should look something like in the below screenshot. Double-click the port type package. 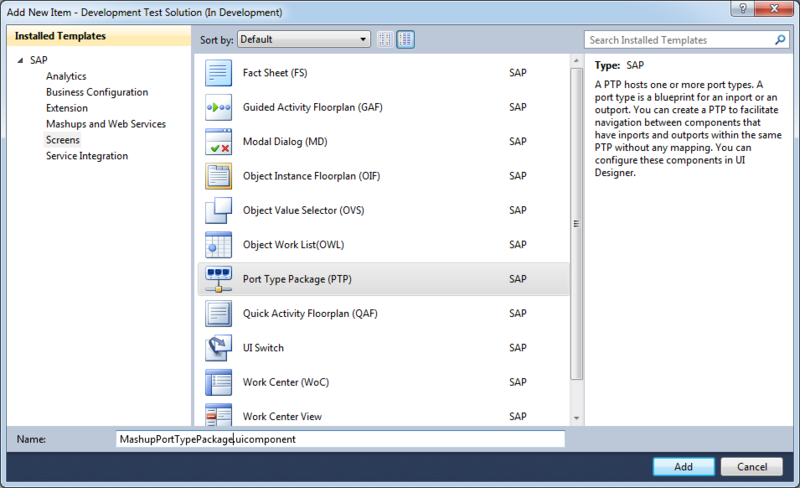 The port type package opens in the user interface designer. To add a port type, select the root node and then click +. 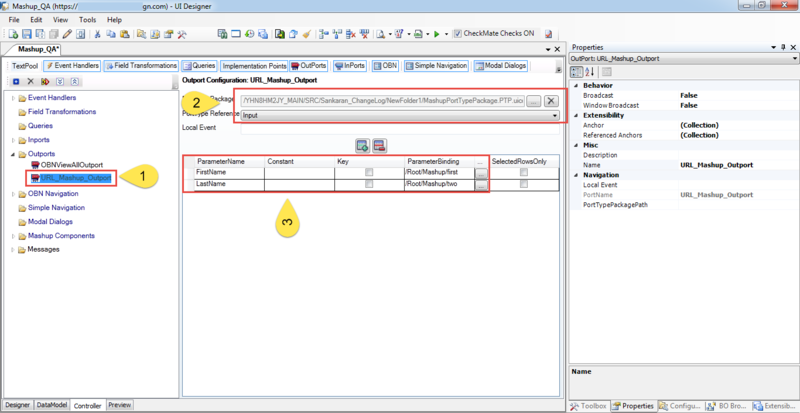 To add a parameter, right click on the port type and choose Add Parameter. As per our requirement, add two parameters and rename it as FirstName and LastName. Certain fields on screens are predefined as screen out-ports and in-ports. These screen out-ports and inports are grouped together as a port binding. The port binding defines the type of information that can be used in the mashup and defines on which screens you can use the mashup. The mashup category specifies which port bindings are available. However, you can also create your own port bindings for your solutions, if required. 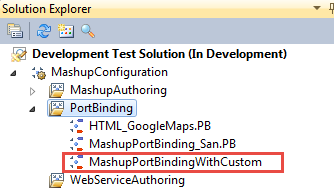 Create a Mashup Port Binding. Add -> New -> Mashup Port Binding. Enter a name for the port binding and click Add. 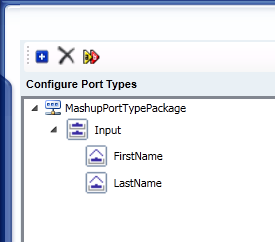 You can see your port binding package under Mashup Configuration. Right-click the port binding, and choose Open. The UI designer opens, displaying a dialog box that contains the name of the port binding in the title. 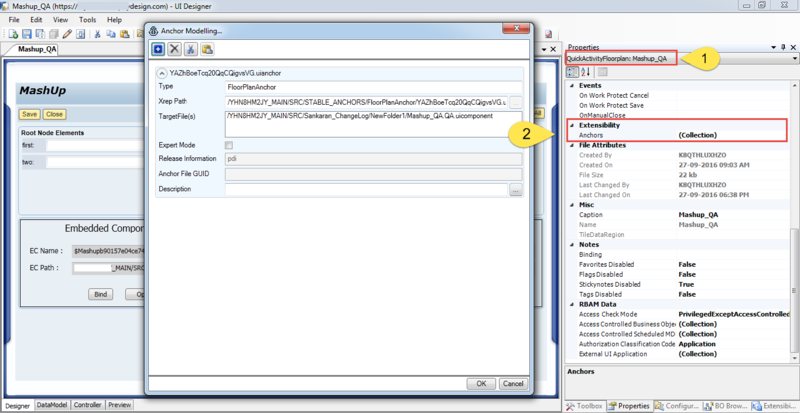 Choose Inport Type Package which you’ve created in Create a PTP Package step 4. Inport Type Reference as Input (you have mentioned this name when creating the port type package) and leave the rest blank. Depends on your requirement, you can create either URL or HTML mashup. 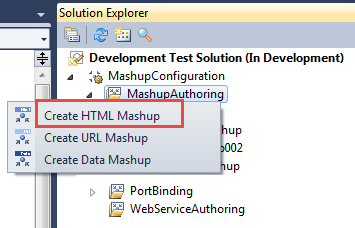 Here you can learn both URL and HRML Mashup creation. Create an URL Mashup as shown below. If any window pops up asking you to turn ON Admin Mode, click “Yes”. Doing so, you are making this mashup as a part of your solution. QAF Builder pops up asking you to enter details of URL Mashup. Select the same category which you used in step 4. 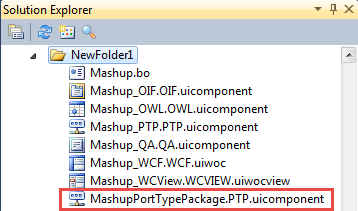 In the OVS of Port Binding, you will now be able to see your PTP Package. Select it. Type in some name and Description (optional). Enter the “URL” of the external application. For your reference here I have attached some simple URL. I will keep this URL open. www.sankaranss.com/tutorial/mashup/calc.html – It will simply open calculator screen. In the table below URL Information section, click “Add” twice and Enter first and last as URL parameter and click on Parameter Binding OVS. You should now be able to see the parameters you created in Step 3 as shown in below screenshot. Select FirstName in first URL Parameter and LastName in last URL Parameter. Click the Preview link to display the end result of the mashup. Finally, Your URL Mashup looks like as shown in below screenshot. Create an HTML Mashup as shown below. QAF Builder pops up asking you to enter details of HTML Mashup.Create an HTML Mashup as shown below. Choose the type as a URL and then enter the custom URL. For your reference here I have attached some simple URL. I will keep this URL open. In the HTML Code Editor, you can copy or enter your own HTML code. In the later article, we will clearly see about HTML Code, which is used in Mashup. Finally, Your HTML Mashup looks like as shown in below screenshot. Now our Mashup is ready, let us proceed with adding it on SAP/ Custom screen. In step 5, we created both URL and HTML mashup. 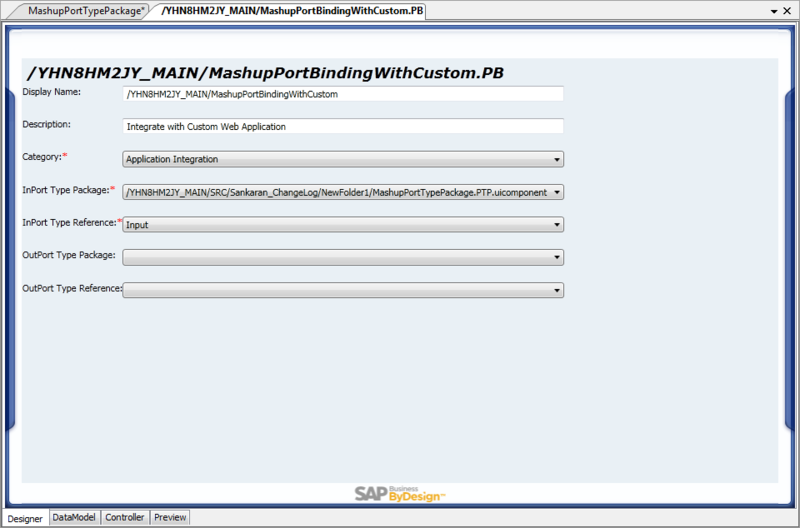 Here we going to learn how to add that mashup in SAP / Custom Screen. Open our Custom BO’s QA screen. Create an anchor for floorplan as shown in the below screenshot. 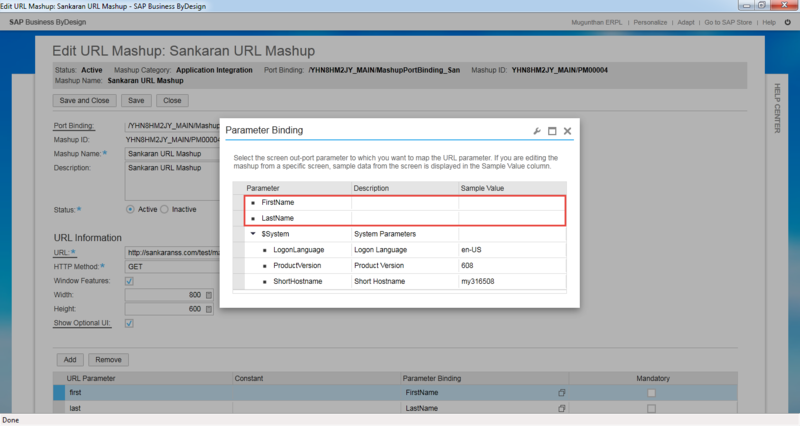 We need the screen to communicate with Mashup which is the prime reason to create URL Mashup with parameters. 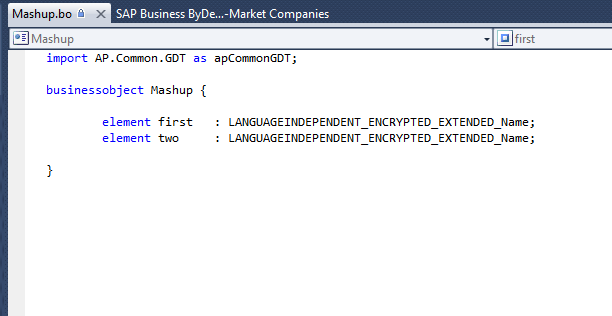 So, we need a way to send out data from our BO instance to Mashup. For this, we need an outport to be configured as shown in the below screenshot. Bind the parameters of your data model structure. We need to create an anchor for Outport by selecting Anchor from its Extensibility properties. Outport now has an identity of its own. We are going to add simple search HTML Mashup without any outport / Inport. In the later article we will clearly see about this topic. Configuration Explorer -> Your_Project_MAIN -> Src -> <Your Project Folder> -> Massup -> Pipe -> (here you can see all your URL / HTML / Data Mashup) -> Choose your Mashup -> Drag and Drop your HTML Mashup into the Screen. Click on “Adapt” and then on “Enter Adaptation Mode” on the top contextual menu and then on “Edit Screen” from the same menu. Click on “Mashups and Web Services”. You should be able to see your Mashup in the list as shown in the below screenshot. Enable it and Leave the Adaptation mode. Log in as a business user and navigate to the QA Screen by creating a custom BO instance or SAP Floorplan. Click on “Mashups and Web Services”. You should be able to see your Mashup in the list as shown in the below screenshot. Save and Publish the changes. Leave Adaptation Mode. Add URL Mashup in Custom Screen. 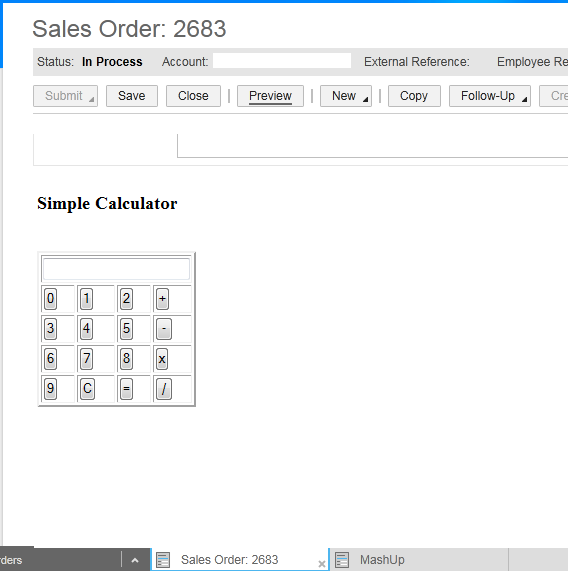 Add HTML Mashup in SAP Screen (Sales Order Screen). You should now be able to see a new button “Web Services”. Enter the value and click the Webservice button. It will navigate to the custom page with the value you have entered in QA Screen. 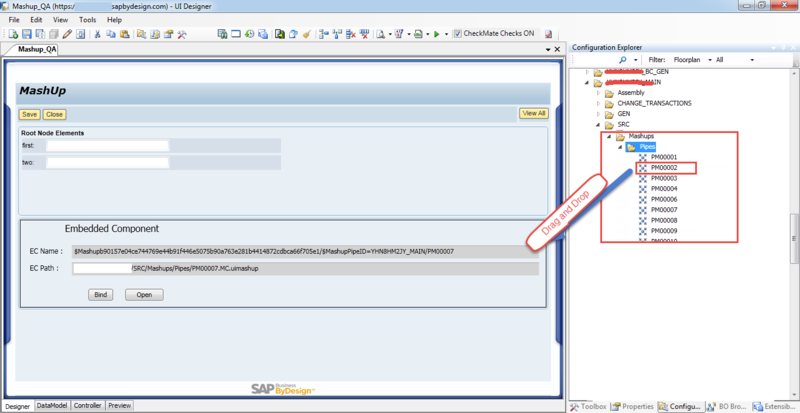 Navigate to the QA Screen by creating a custom BO instance or SAP Floorplan. For URL Mashups, make sure that you disable popup blocker. SAP Cloud sites run on https but when you try to bring in mashups which fetch content from HTTP, they will be blocked by browsers. You can notice small popup by browsers indicating that they blocked some content from being displayed. In this case, you should enable MixedMode for browsers.If you see below error message in your case, please make sure to click No. we have seen about mashup, and in the future article, we will learn more about it. Don’t forget to subscribe and leave your comments. web page dailly and obtain nice data from here all the time.